Searching for a career that fully utilizes your talents? Baffled by the number of career paths open to you? Ready to commit to a career where you can truly make a difference? The help you need is now available inside one box—in a fun, easy-to-use format that will enable you to reinvent yourself for today’s challenging job market and guide you on your path to career success. Seattle-based career counselor/coach Halimah Bellows, MA, MS, CCC, CPC has designed this set of CAREER QUEST CARDS TM© as a unique and affordable strategy for developing a fulfilling new career. Whether you are a mid-life professional making a career transition, a recent college graduate without a clear career direction, a retiree embarking on a new stage in your work life or a dissatisfied job-holder who has never before considered a real career, CAREER QUEST CARDS TM© can offer you a practical, portable tool for finding the work that is right for you. 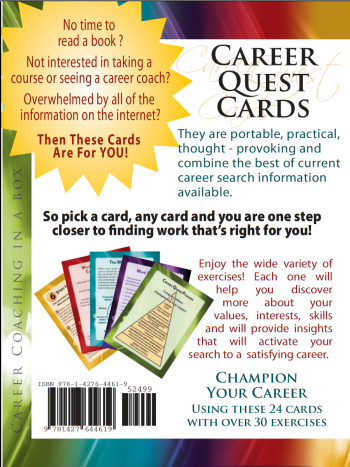 Packaged in a convenient, portable 4½-by-6-inch clear plastic box, the set of 24 CAREER QUEST CARDS TM© provides a distillation of 30 key career-coaching exercises. The cards are color-coded in five categories, allowing an individual the flexibility to work with the cards randomly or use them in a sequence that suits his or her own learning style. Individuals are encouraged to keep journals to track discoveries that they make about their values and preferences in the process of doing the exercises. [easingslider] Career coaches and counselors, career development professionals and outplacement consultants, as well as high school guidance counselors and advisors can also utilize the CAREER QUEST CARDS TM© in working with their students or clients. The brochure in the package of cards includes suggestions for using the exercises interactively with individuals or organizing workshops where people work together as partners or in small groups. Young people in particular may find the colorful cards more fun than reading a book about career development. Halimah Bellows is a seasoned career counselor/coach with more than 20 years of experience as well as an educator and educational planner for colleges and non-profits on the West Coast. She has appeared as a guest on a number of radio talk shows in the Pacific Northwest. She is available for counseling, coaching or presentations at hbell@clarityandaction.net or careerquestcards@gmail.com. FOR ANDROID, iPHONE AND KINDLE FIRE! For job-seekers committed to reinventing themselves in the new year, career counselor/coach Halimah Bellows, MA, MS, CCC, CPC has now incorporated her innovative CAREER QUEST CARDS TM© into a convenient format that can be instantly downloaded on any connected iPhone, Kindle Fire or Android device. The app provides a distillation of 30 key career-coaching exercises in a colorful, fun, easy-to-use package designed to enable busy users to take it with them on the go as they explore possible paths to career success. Mid-life professionals making career transitions, recent college graduates without a clear career direction, retirees embarking on a new stage in their work lives, dissatisfied job-holders who have never before considered a real career–all can benefit from this powerful career-building tool. CAREER QUEST CARDS TM© provides an affordable alternative to paying for the cost of a career coach. The app uses color-coding to enable individuals to work in a sequence that suits their own learning styles—random, by category or fast track. CAREER QUEST CARDS TM© also provides a notepad for tracking discoveries that users make about their values and preferences in the process of doing the exercises. We’re continuing our series of useful phone apps – the ones that help your life and make it easier, rather than allowing you to be lazy and waste some time. This time, we’re looking at an app on the Amazon App Store, an app called Career Quest. In school, from the moment we start our education we are only taught things that we can use in our careers. Lessons upon lessons of what we should be able to do in the future, but there’s little to no knowledge about how you can actually go about putting that knowledge into practice. Career advice is, in my opinion, one of the most underrated services out there right now, and it’s exactly what Career Quest does great. Career coaching sessions are usually very expensive. Naturally, they work better than this app, but they are, for the most part, done by professionals with years, even decades of experience in the field, with psychology degrees and tons of other credentials. If you feel like you are on the verge of making your decision, but you need just that little push to help you consider, then Career Quest is really an option worth taking into account. With a complete set of unique strategies that are designed to help you in your career transition. The app is available on the App Store for $6.19 right now, doesn’t require a ton of permissions, and everybody who has tried it out so far speaks highly of it. Try Career Quests yourself! Donna Seebo, who is an International mental practitioner, counselor, speaker, teacher, award-winning author and radio/TV personality, talk show host had me on her radio show a few months ago to talk about the coaching tool I developed, Career Quest Cards. She recently sent me the link to that show and I would like to share it with you. Go to this link: http://www.delphiinternational.com/ and click on The Donna Seebo Show in the bar on the top. Once you are there, click on the yellowed area to left; Click here to listen to previous Donna Seebo show broadcasts and then scroll down to April 25th and click on the box to the left hand side of the page to place a check mark and scroll down to where is says play selected files and click on that and you can listen to the show. I welcome any questions or responses you may have after listening. Donna Seebo-Radio, Television, Speaker, Counselor, Mental Practitioner, Author www.delphiinternational.com. We invite you to look through the various pages to find out more about Delphi International, Vision Broadcasting and Mrs. Seebo’s Classics.